At about 6:00 this morning, my phone rang. It was Ajarn Yai (principal) from Bangkhonthii school, agreeing with my sentiment that I shouldn’t drive down there today. “Well, see you next week,” she said in a characteristically Thai manner. Coup? Oh, mai pen rai! Since last night, all of the foreign channels on cable have been blocked – even “Spongebob Squarepants!” Who knew he was subversive? Conflicts between to military groups, one pro- and the other anti-Thaksin, had been mediated yesterday by the head of the King’s Privy Council – a body that serves as the mouth of His Majesty in politics. The negotiations broke down during the afternoon. Prime Minister Thaksin staged an initial coup, going on air live from New York announcing a state of emergency and firing the military supreme commander, General Sondhi (I’m modifying the spelling from what I used last night to more accuracly reflect the pronounciation). The military was already at the TV stations (some local stations are owned by the military) and pulled the plug mid-way through the announcement. Except for Channel 9, which played the entire statement. 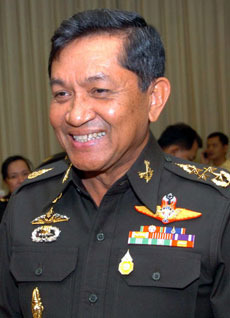 It was at that point that troops led by General Sondhi (pictured left) staged the counter-coup. The Fourth Army Brigade took up positions around key government buildings, including all ministerial offices, the Dusit Palace and Government House. One motivation that has been cited is that there was a major protest scheduled for today by anti-Thaksin forces called the People’s Alliance for Democracy. The armed forest police based at Khao Yai National Park (90 mins away) had been called into the city to quell the protest. The military decided to stage the counter-coup at this point to prevent what could have become a violent clash between the forest poice and the protesters. A few weeks ago, General Sondhi had asked the National Park Department to return 1,000 rifles that the army had loaned the forest police several years ago, claiming that the army had a shortage of weapons. This lead additional creedence to rumours of a possible coup. There’s a coup going on. Stay home and lock the door for safety! As for today, a national holiday has been declared: schools, the stock market, and government offices are closed. Traffic on Asoke is still pretty heavy, so not everybody has received the message. I hope you guys are okay! I’ve been listening about the coup on NPR. Wishing you the best. I guess this is an exciting part about traveling. Exciting, that’s for sure. Although looking out the door, you’d never know it was a coup. Just another rainy morning in Bangkok.